The treble clef charm is silver tone and approx 24x10mm. 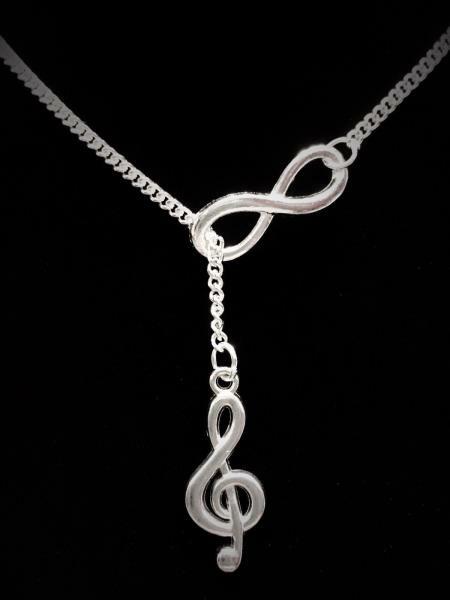 The infinity charm is silver tone and approx 1" long. The chain is silver plated link chain and is 18" long. Has lobster clasp closure on the chain. Made of silver plated alloy. Gorgeous!!! All of our items are brand new, never worn. We ship FAST (Usually next business day). We take great care in packaging so that your item is protected during shipping. Please contact us with any questions. We provide tracking numbers when order is shipped. Items must be returned in new condition, along with the gift packaging (gift box or organza bag that comes with item must be returned also). If items were sold as a set, all items in the set must be returned. Partial returns or refunds are not permitted.